What began in 2007 as a voluntary reporting system offering eligible medical professionals significant incentives in exchange for reporting data on quality measures relating to patients covered by Medicare benefits becomes mandatory next year. Non-participation carries a financial penalty starting in 2015. Patients with Medicare Part B and Railroad Medicare benefits are included in the Physician Quality Reporting System. The eligible incentive payment for 2014 is 0.5 percent of the total physician’s Medicare Part B Physician Fee Schedule allowed amount. If, for example, the total amount of Medicare billing for the year is $200,000, the incentive for 2014 is $1,000. The penalty for that same amount not reported via PQRS in 2015 is $3,000. Continued non-reporting in 2016 and subsequent years is 2.0 percent or $4,000. Note that this penalty applies to all Medicare Part B billing, not just PQRS related data. That is a significant impact on the bottom line. Radiologists certainly do not want to leave money sitting on the table in 2014, and are less inclined to pay penalties going forward. 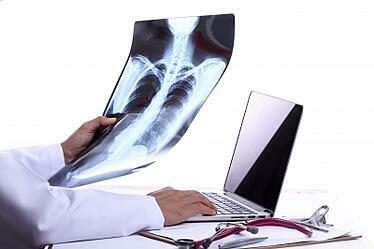 To participate in PQRS, radiologists must add additional documentation to their radiology reports. From that documentation, billing coders can add what Medicare refers to as ‘CPT II Codes’ to the Health Care Financial Administration forms. PQRS # 145: 'Exposure Time Reported for Procedures Using Fluoroscopy: Percentage of final reports for procedures using fluoroscopy that include documentation of radiation exposure or exposure time.' Report this measure every time you perform a fluoroscopy during the reporting period, whether in a hospital or outpatient setting. One concern you must address with this measure is whether you must depend upon a hospital employee to obtain the information necessary for reporting. PQRS # 146: 'Inappropriate Use of “Probably Benign” Assessment Category in Mammography Screening: Percentage of final reports for screening mammograms that are classified as “probably benign”.' Report every time you perform a screening mammogram. Since no additional documentation on the part of the radiologist is necessary, this measure is the easiest to implement. PQRS # 147: 'Nuclear Medicine: Correlation with Existing Imaging Studies for all Patients Undergoing Bone Scintigraphy: Percentage of final reports for all patients, regardless of age, undergoing bone scintigraphy that include physician documentation of correlation with existing relevant imaging studies (e.g., x-ray, MRI, CT, etc.) that were performed.' No diagnosis is associated with bone scintigraphy, which you must report with each performance. PQRS # 195: 'Stenosis Measurement in Carotid Imaging Reports: Percentage of final reports for carotid imaging studies (neck magnetic resonance angiography [MRA], neck computed tomography angiography [CTA], neck duplex ultrasound, carotid angiogram) performed that include direct or indirect reference to measurements of distal internal carotid diameter as the denominator for stenosis measurement.' Report each carotid imaging study. No diagnosis is associated. Reporting the velocity flow is sufficient to PQRS requirements. PQRS # 225: 'Reminder System for Mammograms: Percentage of patients aged 40 years and older undergoing a screening mammogram whose information is entered into a reminder system with a target due date for the next mammogram.' Report each screening mammogram. This is to determine the quality of service each patient receives with respect to mammogram reminders. Measure #256, Surveillance after Endovascular Abdominal Aortic Aneurysm Repair has been retired from the 2014 measures list. Participation in PQRS is a relatively simple way to increase income in 2014, and ignoring the program could constitute a very expensive mistake in the coming years.